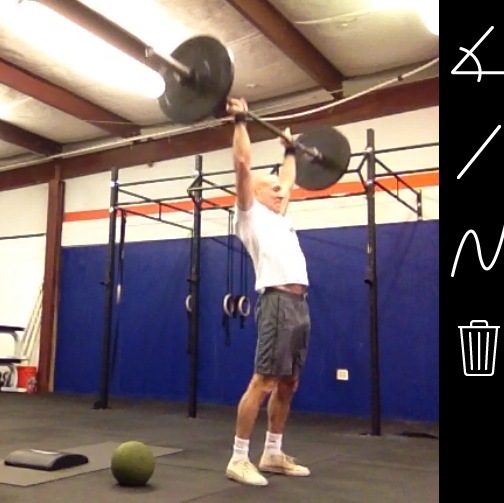 I worked out at 10am this morning, and once again completed today’s programmed WOD at CrossFit Surmount. I made sure to include squats, twists, sit-ups, and back extensions, you know, for active recovery, yo. I do put careful thought into programming. Work up to your heaviest weight. Use DB and/or Kbs. Then, complete 10 man makers as fast as possible. For the first time ever, I practicing using kettle bells. I completed a set of 10 reps using 35# KBs in a time of exactly 2 minutes. That was tough, and merely keeping one’s balance is a struggle when grasping the KB handles. As tomorrow’s WOD includes a mere 12 man makers, I may attempt with 44# KBs. 4, 4-minute Tabatas; rest 1 minute between Tabatas. Complete both Tabatas A and B 2 times. Score = total number of reps. I lifted prescribed weights of (what began to feel heavy) 75#, 20# for Russian twists, and 30# for slam balls. My goal was to work throughout entire 20 seconds of all 32 intervals, i.e., only rest during 10-second rest between activities. Uhm, it doesn’t sound at all like a lofty goal, but I’m here to tell you that this was a very difficult goal to achieve. I kept a running count and recorded total reps at the end of each Tabata. I did occasionally glance a the clock, but relied upon the sound of the beeping clock for beginning and end of intervals. Uhm, it was only upon reviewing recording that I realized I didn’t do the last 20 seconds of SDHPs during the 2nd Tabata; thus, score = 0. Dammit. I would’ve been able to break 600 if I had only completed 9. Dammit. Dammit, dammit, dammit. Looking at my numbers now, I’m pleased with the consistency of my performance, as there was at the most (ignoring zero SDHPs) a 3-rep difference during any interval and I completed about the same number of or even increased the number of reps the second time through both Tabatas. I really, really, really, wanted to rest during the last 2 minutes of the last Tabata. I. Did. Not. My. Goal. Was. Achieved.